Punta Cana is part of the newly Punta Cana-Bavaro-Veron-Macao municipal district in La Altagracia, the easternmost province of the Dominican Republic. Until recently it was one of the most remote and beautiful places on earth. The area is best known for its beaches, which face both the Caribbean and Atlantic, and it has been a popular tourist destination since the 1970s. The Punta Cana area has an estimated population of 100,000 with a growth rate of 6%.1 To the north, it borders the village and beach of Cabeza de Toro, and then the Bávaro and El Cortecito beaches. The nearest city, the 500-year-old capital of the Province Higüey, is 45 kilometres (28 mi) away, and it takes about an hour to drive there. Europeans, particularly Spanish hotel chains, own all but two of the 50+ megaresorts of the Punta Cana tourism destination. The time zone in Punta Cana is in the “America/Santo_Domingo” timezone, commonly abbreviated EST*. This timezone does not apply the Daylight Saving Time (DST) scheme – it uses standard time throughout the year. The offset to Universal Time (UTC, GMT or Zulu) is -4:00 hours. The resort is located the east side of the Dominican Republic, famous for being home to the best beaches on the island. Punta Cana is considered to be one of the most desirable destinations by tourists who wish to get away from it all in a dreamlike setting in which they can relax, practice their favourite sports, play golf, eat fresh seafood on the sea shore or simply stroll along the endless beaches at sunset. The complex of 320 thousand square meters and a low density in construction, it has 2,000 rooms distributed in four resorts and 1,800 employees. One of its greatest examples of environmental conservation is not common and might pass unnoticed: right in the Centre of one of the hotels retain 150 meters of almost virgin forest populated with native and endemic plants and crossed by a footpath that, in seconds, puts the visitor in pure contact with nature. 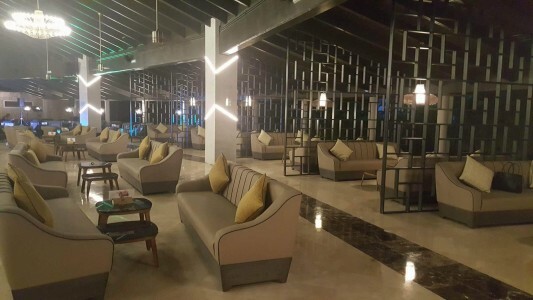 The resort consists of 2000 rooms divided into four main areas: Grand Palladium Bavaro Suites resort & Spa houses 679 rooms, Grand Palladium Punta Cana Resort & Spa has 669 rooms and Grand Palladium Palace Resort Spa & Casino holds 280 rooms. Patrons staying in any of these areas have full use of all their facilities. TRS Turquesa Hotel is an adult’s only portion of the resort and houses 372 rooms.